Recently I came across a blog whereby there's a page exclusively questioning about our religion; Islam (The page is labeled as "A few simple questions for Muslim visitors"). After reading the whole page, I was furious but somehow I calmed myself down, Istighfar a lot of times and reminded myself that the long-written blog entry was written by a non-believer. And it's clear that non-believers (the blogger is a Christian) will never believe anything that we believe in our Holy Quran and that's how they'll write to channel in their skeptiscm towards the Holy Quran and Islam. But then I thought, what if, one day I meet someone like the blogger in real life (and not through the internet) and what will I answer if he asks me the presumed-"few simple questions"? Will I get to answer all his skepticism towards Islam without being twisted and confused by him back? Or will I fail defending my religion and let him leave, rejoicing his false opinion on Islam and let him have the thinking that what he believes in all this while is true? Will the knowledge that I have which is in my opinion is quite insufficient (since I'm still learning too) will able to make him at least to try to re-think of all the things he doesn't believe? Sis, have you ever encountered this situation before? And do you have any advice for this? I had this experience of one my colleagues talking wrong about Muslims. At that moment I was just doing my work and didn't understand clearly, so I just kept silent. What do we do at such circumstances? It really hurts to work in such an environment. Can you share if you ever experienced such situations. Thank you for your questions. Islamophobia is a serious problem that many Muslims face today and more than ever before we have to be prepared with the right attitude and knowledge to deal with this challenge. The best thing to do is to accept it as a test. I've never faced extreme Islamophobia before, alhamdulillah, but I've had my fair share of it. There's a difference between having questions and asking questions with false intentions. I once came across a website which posed very cynical questions about Islam. The blog owner commented on one of my blog posts and asked me to answer a few questions on his blog. I suspected that he was an Islamophobe when I read his blog posts. The problem with such websites is that they are created to provoke Muslims and therefore it is easy to get carried away with online debates. I think it's best to leave such websites alone. 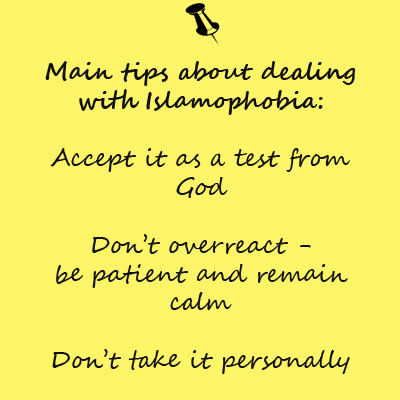 If you were to have a one-on-one encounter with an Islamophobe try to be patient and stay calm. Your actions are a reflection of Islam so be mindful of how you choose to represent your faith. Prophet Musa (peace and blessings be upon him) was told by Allah swt to have adab (good manners) when he was commanded to speak about Islam to Pharaoh, the most cruel and hated man at the time. Say what you have to say by presenting your argument to the best of your ability with the knowledge that you have. If you don’t know the answer, remember that half of wisdom is in knowing when to say, “I don’t know.” If you want, tell them you would like to find out the answer and then get back to them when you can. As Muslims, it is our duty to uphold the good name of Islam not only through our words but also our actions. Half of da'wah is in the way we carry ourselves and how we treat others in our daily lives. You might not be aware but people are always observing and many times due to lack of exposure to other Muslims they might make generalisations about Islam based on our actions. Additionally, the media is filled with misrepresentations of Islam and Muslims. Sometimes it’s hard to blame non-Muslims for having the wrong perception of Islam. In non-Muslim countries we need to make extra effort to allow people to get to know us and see that Muslims are good, normal people. Muslims can appear to be intimidating so be polite and friendly to your colleagues and encourage them to ask you questions about Islam. This way you will have the opportunity to explain concepts that they might not understand. I also want to highlight something that I feel is very important: don't take Islamophobia as a personal attack. It's most probable that people feel it's okay to say mean things about Islam to you because they don't know you very well. It's also important to remember is that Islam is a peaceful religion and there is no concept of compulsion in our religion. 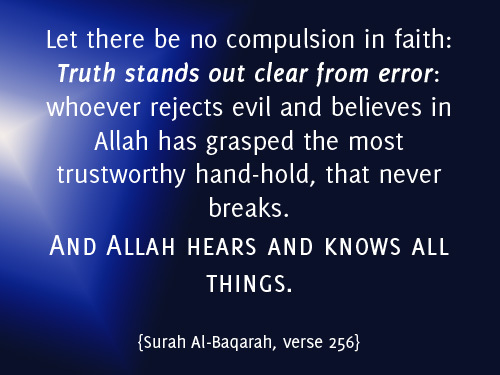 In the Holy Qur'an there are many reminders about how only God can guide people to open their hearts towards Islam (e.g. Surah Yunus, 99-100, Surah As-Shuara, 3-9, Surah Al-Fatir: 8). It is not our place to compel others to believe what we say. Our role is only to convey the good message of Islam which emphasises the Oneness of Allah swt. Indeed, your Lord is most knowing of who has strayed from His way, and He is most knowing of who is [rightly] guided. Despite its disadvantages I believe there is a blessing in Islamophobia. It's a wake up call for Muslims to check themselves and see how they might be misrepresenting Islam. This is the time to educate ourselves and brush up on our knowledge of Islam and to be more united and active in our communities. Islamophobia is also a lesson of humility and patience. It teaches us to be strong and to practice good manners (adab) when dealing with Muslims and non-Muslims alike. Yes, we are going through some tough times but think of Maryam, mother of Prophet Isa, Asiya, the wife of Pharaoh, and Sumayah bint Khayyat (may Allah swt be pleased with them) who went through great trials because of their belief in God. And not to mention all the Prophets (may Allah swt be pleased with them) as well. Every single one of them were tested tremendously. But these tribulations elevated their iman (faith) and their rank (darajah) in Allah's sight - ultimately, these trials made them closer to Him. So don't let this break your spirit and don't be victimised by Islamophobia. Instead, allow yourself to become a better person because of it, inshaAllah. 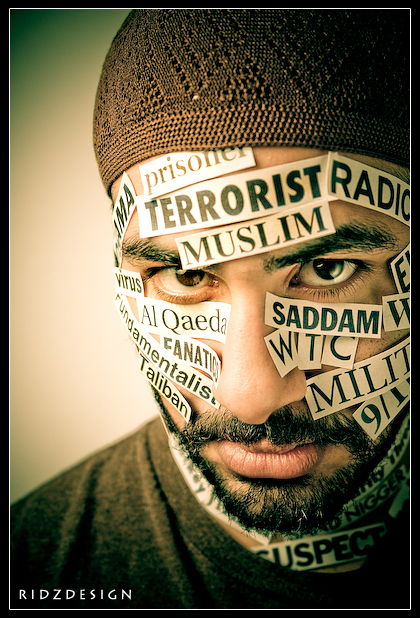 Have you ever experienced Islamophobia? Do you have any advice you'd like to share? It wasn't clear for me whether the text in question was written in slandering or just in a wondering way? In any case it should be remembered that religions are different and it's natural in that sense that people see it (religion) from their own perspective. Muslims don't share the same beliefs as christians and vice versa. I myself am an atheist and I do see lots of bad things being done in the name of religion. And I do believe that being extreme in any religion is very bad and dangerous thing since it obscures peoples judgement. Unfortunately it is a simple fact that bad and disgusting things happen in the name of all religions but it doesn't mean that the religion in question is bad or to be blamed for this. However, we all should always remember to respect each others cultures and religions, because we are all equal human beings on this earth. This also applies to Arab cultures in which the western culture is pretty much always seen as a bad and immoral. This has to work both ways otherwise it just causes feelings of unfairness. I know I mix culture and religion in this rambling but in many cases they are intertwined. Anonymous, thanks for sharing your perspective. I agree that a lot bad things have been done in the name of religion but it doesn't mean that religion was ever the real motivation. The blog that was referred to in the first question didn't allow comments to be posted so I don't see the purpose of asking Muslims to answer them if he/she is not giving them the chance to voice out their opinions. Like I said, there is a difference between asking out of curiosity and asking with a hidden agenda - the latter can be quite hurtful. I am part of an interfaith organisation at uni and I always encourage friends to ask questions. I'm always happy to answer them, even questions like: "Why do some Muslim women wear black while others dress more casually?". It seems like a simple question but it helps people to understand the difference between Islam and culture. And I also think that the East always sees the West as a bad influence when in fact there is good and bad everywhere we go. I don't think the East is better than the West, or vice versa. However most times we do put Western ideals on a pedestal (ethnocentrism) and it's time people realise that no one is better than one another based on where they come from. We have to learn to respect the fact that different religious and cultural practices exist and treat each other with more understanding and tolerance. Otherwise, as you said, it will just lead to feelings of unfairness. nice article sis. Just wanted to add a short comment on a trap I see many of us attempting to counter Islamophobia often fall into. I think it’s important to be careful in responding to Islamophobia that we don’t fall into the trap of being overly critical of Muslims who are viewed as backward by many privileged Westerners. While yes, it is true that there are a number of issues that are in need of addressing, we need to remember that these societies are that way largely because of the extreme exploitation that has taken place, transferring the wealth of the Third World into the First so that the unprecedentedly high standard of living here can be maintained. It’s easy to castigate and dismiss those of our brethren over there as being backward to avoid embarrassment in the eyes of our neighbours, yet it’s important that we do not forget our responsibilities towards them in speaking out against the causes of their backwardness. What I’m trying to say is let’s be careful that we don’t purely focus on pleasing or making ourselves appear friendly to those in the West whilst ignoring the task of speaking truth to power. Thanks to your post this time b'coz it helps me to face this kind of problems. Interesting Mu'adh! Thank you for expanding the discussion. JazakAllah Khair. "I think it’s important to be careful in responding to Islamophobia that we don’t fall into the trap of being overly critical of Muslims who are viewed as backward by many privileged Westerners." I'm not quite sure where the issue of backwardness came from. Perhaps when culture was raised? That was something I overlooked, to be honest. What exactly did you mean by backwardness? When I referred to culture vs. Islam I was mainly addressing things like women not being able to drive and honour killings. I don't think they are a result of a colonialism or Western exploitation. However, I feel we shouldn't be too defensive of acts like suicide bombing. Rather I think it's important to highlight both sides of the story: the anger and frustration that causes them to do such things and the fact that it's forbidden in Islam to commit suicide and kill innocent people. But if you were referring to culture in terms of lifestyle (which I think is more probable because you and your wife have spent a substantial amount of time in S.E. Asia) then that's why I touched upon the issue of the existence of various cultural practices and the need for people in non-Muslim or Western countries to respect that and be more tolerant and understanding. Because as you said, most times they are long-term effects of things like Western colonialism and capitalism. Your welcome FanaFiniFina. Glad you find it helpful! Thank you for writing this out. Have been quietly reading your blog for awhile now but this hit home in many ways. Yes you're right alot of times the questions or snide remarks are not being directed personally (which alot of times - being in a country with a hijabi being 1 in a 1000s - feels like it) plus they just do not know us well enough hence the questions. Love all your posts! Subhanallah, just yesterday I had experienced the worse islamophobia. Usually it's more subtle, and not "in my face", but yesterday I was yelled at by girls my age and I felt incredibly humiliated. Days and days of this tension just built up inside of me, and I couldn't help but snap yesterday. I live in Australia in a small city, and I just started working couple of weeks ago. I always get weird questions about my religion, and it's very obvious they have a bad intentions behind it. I get stared at, I get treated differently, I also get smart comments thrown at me. I usually let it slide, laugh, ignore or reply with a smart comment, but yesterday I got to the stage where I had enough. I thought to myself, what gives them the right to think they can just walk all over me and say such humiliating things? I think what made me lose the plot was when they said, You're in Australia, take that sh*t off! Go back to where you came from! I've had enough of racist anglo's thinking their opinion is correct, and that their value as a human being is higher than everyone elses. Of course, I regretted it after, because as a Muslim it is not something I should of done. However, I have learnt from this encounter and next time inshaAllah I will deal with it much differently. I'm hoping next time to just skip away while singing really loudly. Or do a little dance or something haha. Thank you for this post Shahirah, it was definitely what I needed! Nevin, I am so sorry to hear about your experience with Islamophobia. I can understand why you would snap. Don't be mad at yourself. Some people really had it coming. I think you've been patient for so long and you're only human! I really hope Allah swt will grant you ease and reward you abundantly for all you've put up with. InshaAllah, Jannah for you, nothing less. would like to ask these few questions. is Islamophobia only directed from a non-Muslim to a Muslim? what if it's from a Muslim to a Muslim? i mean a Muslim but not really practising the Islam ways and they try to bring another Muslim down. for example, asking me in a provoking manner, why do i have to start wearing hijab when i was really "open" back then and probably, i wear the hijab since it's the "fashion" nowadays. maybe, the question was raised to me as i just started donning the hijab. so i just kept quiet, since i don't really know what do i have to answer these people back. so i would love to hear what's your answer/opinion gonna be like if someone, be it a non-Muslim or Muslim, ask you "why do you have to wear the hijab in this modern world?" Wa alaykummusalam Anon #3, thank you for your comment. That's a really good question actually. I was just thinking about it yesterday - what about Muslims facing discrimination from other Muslims? This post was great, also the coments of the entry. Alhamdulillah I have never experienced islamophobia, but I know the feeling when people around you ask many questions which you don't know how to answer. Anyway, the tips you have shared are so good, Thanks Sha.